There is something terrifically refreshing about a book that refuses to take anything on faith, that challenges the reader to provide the evidence for what we know to be true. With considerable fanfair from free market right-wing business, a young Danish statistician has done just that with the doomsday claims of environmental activists. His target are the public statements of Greenpeace, the Worldwatch Institute, the World Wildlife Fund, in his view a litany of exagerations and myths. Using detailed examinations of statistics, he repeatedly catches these organizations in false or exagerated claims. These are easy targets, but the book becomes more interesting when Lomborg takes on global warming predictions He thinks the climate models are biased in a way that exaggerates the effect of greenhouse gases, and that the Kyoto targets for reducing CO2 emissions will thus impose enormous economic costs to no real benefit. Few atmospheric scientists agree with Lomborgs analysis of the climate models, but it is fun to see him bait the tiger. 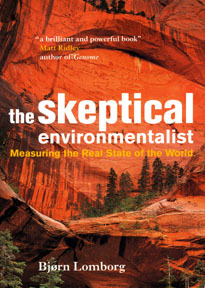 Lomborg is particularly skeptical about the rate of tropical forect loss (he has found an annual loss estimate that is 1/4 of the figure cited by most environmentalists), and doesnt like Norm Myers conjecture that we are losing 40,000 species a year, pointing out that the IUCN estimates of mammals and birds are 1/20 of that — a statistician, Lomborg misses Myers point that not all organisms are mammals or birds, or have been extinct for the IUCN 50-year disappearance window. Harshly critical of environmentalists, Lomborg should be read — but not necessarily swallowed — by anyone interested in the environment.